The Fuji Spray Tanning HVLP Hose. 1/4" thick Black Comfort Mat with rounded corners covers a 4x4 area. 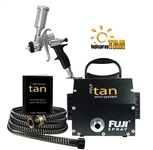 The Fuji Spray Tanning HVLP Gun has very High-Efficiency and Aircap is an exclusive feature from Fuji sprayer. Our 2016 PRO Lite Sunless Over-spray Reduction Booth extracts over-spray from air during sunless airbrush tanning application. This kit pays for it self!